'AUSTRALIA VI' by Brook Andrew emanates from a series of large-scale works that re-present a selection of 1860s etchings by Gustav Mützel. Commissioned by Prussian naturalist William Blandowski following his expedition of 1854–55, Mützel's etchings depict the cultural activities of Australian Aboriginal peoples. 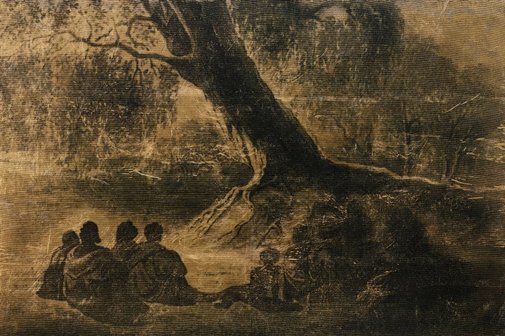 Mützel, however, did not visit Australia himself, but rather worked from materials provided by Blandowski to develop his etchings. By importing such images into his work, Andrew problematises ideas about truth and representation. He highlights the fact that 'few art works...represent fantastical Australian Aboriginal cultural activities and landscapes without...paternalistic cravings'. Reflecting on European curiosity, Andrew presents an explorer's view of Aboriginal life away from the British colonies. He examines how Australia is perceived from the outside looking in - a question with both historical and contemporary resonance. In 'AUSTRALIA VI', Andrew presents an enlarged version of Mützel’s originally small nineteenth-century bookplate, shrouded by the work's foil surface. At its significantly expanded size, the image reflects the genre of history painting - the canonical paintings of Western art which document historical and mythologised events on a scale that is both intimidating and awe-inspiring. Yet, the artist challenges and subverts this genre, producing an enigmatic work that critically disrupts conventional viewpoints. Its metallic finish conjures romantic notions of Aboriginal culture; the lure and magic perceived by nineteenth-century Europeans.